Users licensed for the data service can access our Mexico gas balances by clicking here. 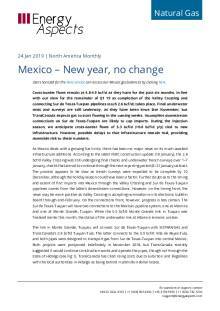 Cross-border flows remain at 4.8-4.9 bcf/d as they have for the past six months, in line with our view for the remainder of Q1 19 as completion of the Valley Crossing and connecting Sur de Texas-Tuxpan pipelines (each 2.6 bcf/d) takes place. Final underwater tests and surveys are still underway, as they have been since late November, but TransCanada expects gas to start flowing in the coming weeks. Incomplete downstream connections on Sur de Texas-Tuxpan are likely to cap imports. During the injection season, we anticipate cross-border flows of 5.3 bcf/d (+0.6 bcf/d y/y) tied to new infrastructure. However, possible delays to that infrastructure remain real, providing downside risk to these numbers. As Mexico deals with a growing fuel crisis, there has been no major news on its much-awaited infrastructure additions. According to the latest FERC construction update (18 January), the 2.6 bcf/d Valley Crossing was still undergoing final checks and underwater trench surveys over 1–7 January, checks that are set to continue through the next reporting period (8–21 January) at least. The process appears to be slow as trench surveys were expected to be complete by 10 December, although the holiday season could have been a factor. Further doubt as to the timing and extent of first imports into Mexico through the Valley Crossing and Sur de Texas-Tuxpan pipelines comes from the latter’s downstream connections. However, on the timing front, the news may be more positive as Valley Crossing is accepting nomination on its electronic bulletin board through end-February. On the connections front, however, progress is less certain. The Sur de Texas-Tuxpan will have two connections to the Mexican pipeline system, one at Altamira and one at Monte Grande, Tuxpan. While the 0.5 bcf/d Monte Grande link in Tuxpan was finalised earlier this month, the status of the underwater link at Altamira remains unclear. The link in Monte Grande, Tuxpan, will connect Sur de Texas-Tuxpan with SISTRANGAS and TransCanada’s 0.9 bcf/d Tuxpan-Tula. The latter connects to the 0.9 bcf/d Villa de Reyes-Tula, and both pipes were designed to transport gas from Sur de Texas-Tuxpan into central Mexico. 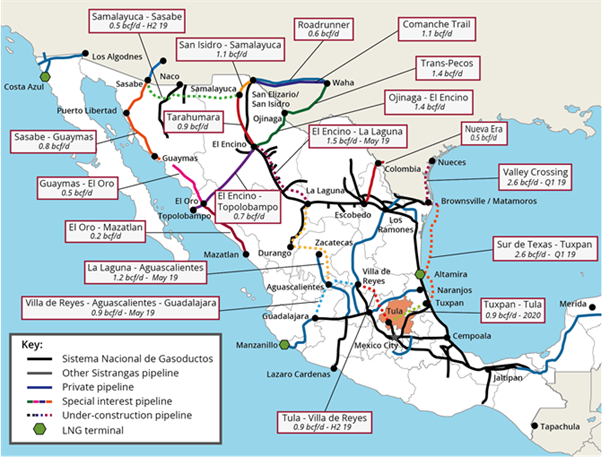 Both projects were postponed indefinitely in November 2018, but TransCanada recently suggested it would continue construction works and operate the pipes, though not through the state of Hidalgo (see Fig 1). TransCanada has cited rising costs due to extortion and illegalities with the local authorities in Hidalgo as being behind multimillion-dollar losses. Developments at the three CCGTs scheduled to become operational this month have yet to be reported. CFE’s 790 MW Empalme II and Iberdrola’s 850 MW Noreste and Topolobampo II would lift gas demand by a combined 0.25 bcf/d once completed and operating at baseload. While there is no news for Noreste or Topolobampo II, Empalme II does seem to be on track to become operational. Available flow data indicate Empalme II—which feeds gas from IEnova’s Sasabe-Guaymas—has been taking gas at inconsistent rates, which is common with power plant commissioning. The plant has consumed an average of 14 mmcf/d so far in January compared to an average of 77 mmcf/d in mid-December. Earlier in 2018, CFE had claimed it could stop tendering LNG as soon as this winter—plans that were far too ambitious in our view (for details see our E-mail alert: Intention versus action: CFEnergia intends to stop tendering LNG, 7 September 2018). By the end of 2018, LNG continued to come onshore, albeit at a slower pace, with imports shrinking by 0.2 bcf/d y/y in Q4 18 to 0.5 bcf/d. 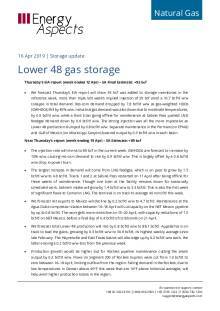 LNG takes at Altamira, which CFE plans to substitute with piped gas from Sur de Texas-Tuxpan once online, declined by an average of 0.1 bcf/d y/y a month in Q4 18, despite reports of acute gas shortages in southeast Mexico. LNG imports will have to continue however, until downstream connections are complete off Altamira, even if they keep apace of current volumes. On the other hand, LNG receipts at Manzanillo have remained largely flat y/y since Q4 18 and takes so far in January are also flat y/y, at 0.2 bcf/d. CFE’s first LNG tender of 2019 sought five cargoes for delivery during February–April, equating to 0.15 bcf/d of incremental supply per month. Imports at the terminal will be replaced by pipeline supply once the Wahalajara pipeline system becomes operational (expected in May, although the risk of further delays remains high) and the reversal of flows on TransCanada’s Manzanillo-Guadalajara pipeline takes place. Our outlook for Mexico’s LNG imports remains unchanged from last month, with takes averaging 0.6 bcf/d (-0.1 bcf/d y/y) this quarter before trending lower at 0.5 bcf/d (-0.2 bcf/d y/y) during the injection season on expectations of additional pipeline supply through Sur de Texas-Tuxpan and some potential flows on the Wahalajara system. We expect Q1 19 cross-border flows to stay mostly flat q/q, near 4.9 bcf/d, and average 0.6 bcf/d higher y/y at 5.3 bcf/d during the injection season. This is a small downward adjustment from last month, as progress on downstream connections and Wahalajara remains unclear.